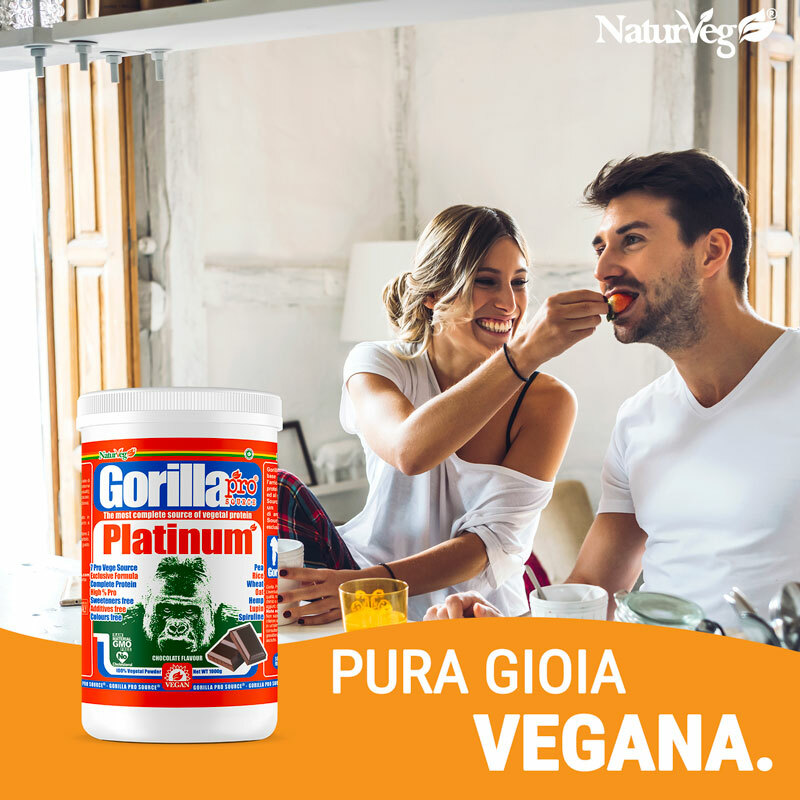 Discover our selection of vegan protein supplements with a fresh and natural flavor, without sweeteners, chemical additives, GMOs and preservatives. Gorilla Pro Source® Bio is a vegan food supplement with an extremely natural taste, produced with organic ingredients, without GMOs and added sugars. 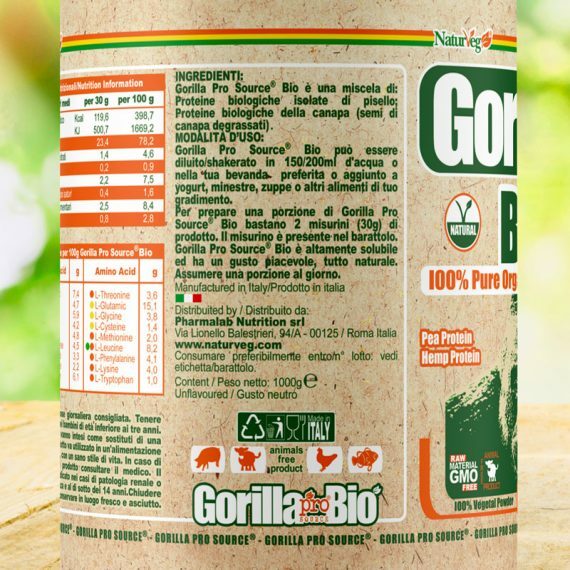 The organic is healthy, rich in active ingredients, has a natural origin, is not chemically contaminated, grows on “clean” soils, with a positive impact on soil fertility. 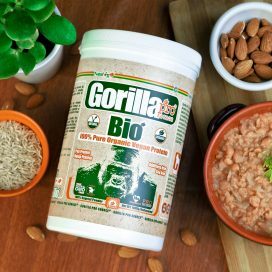 Organic products have a positive effect on the metabolism and the immune system, with a strengthening and supporting effect. In light of all this, Naturveg®, a company specializing in vegan food and supplements, has decided to create a new product, Gorilla Pro Source® Bio, totally organic, pure, qualitative, as always adherent to our corporate philosophy. 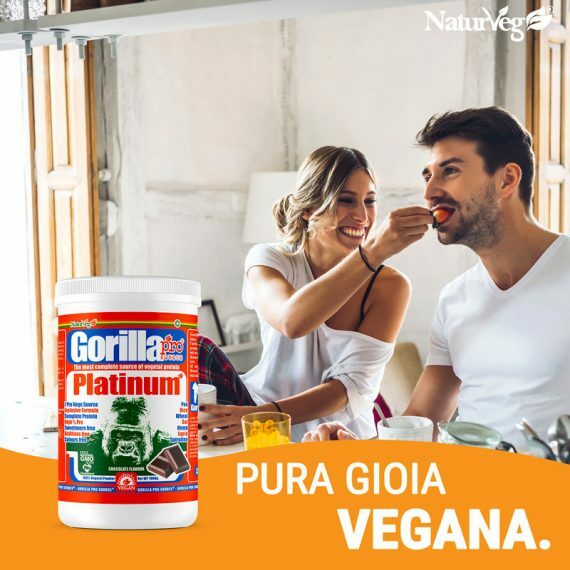 There are no unnecessary ingredients. The Bio has only one and only one ingredient: the raw materials NO GMO and organic. Sweeteners, aromas or anything not present in our organic vegetable sources is not added. To be honest, the addition of any other nutrients would be completely unnecessary because of the nutritional completeness of our Bio. If you are worried about finding artificial sweeteners or carbohydrates (especially if you follow a low-carbohydrate diet), know that in Bio® there is only our formula, perfectly balanced and studied with exclusively natural and vegetable sources. 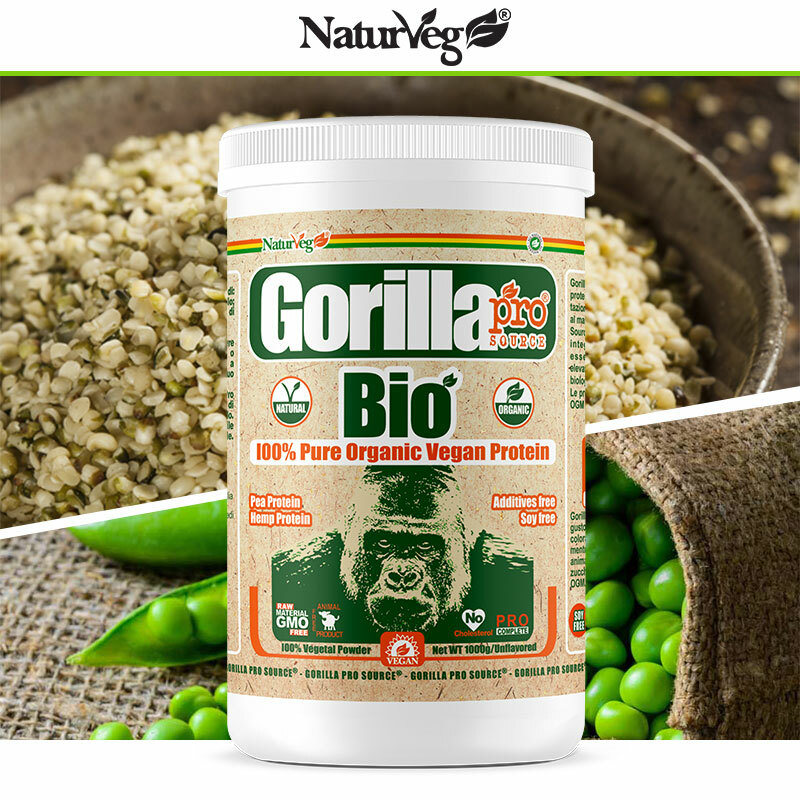 In addition to the exclusively GMO Free raw materials that we normally use for our products, we have also researched organic protein sources, to meet our loyal customers, always looking for exclusive and selected products. We have maintained the naturalness of the taste without adding flavourings and sweeteners, so as to obtain a totally and truly organic product. 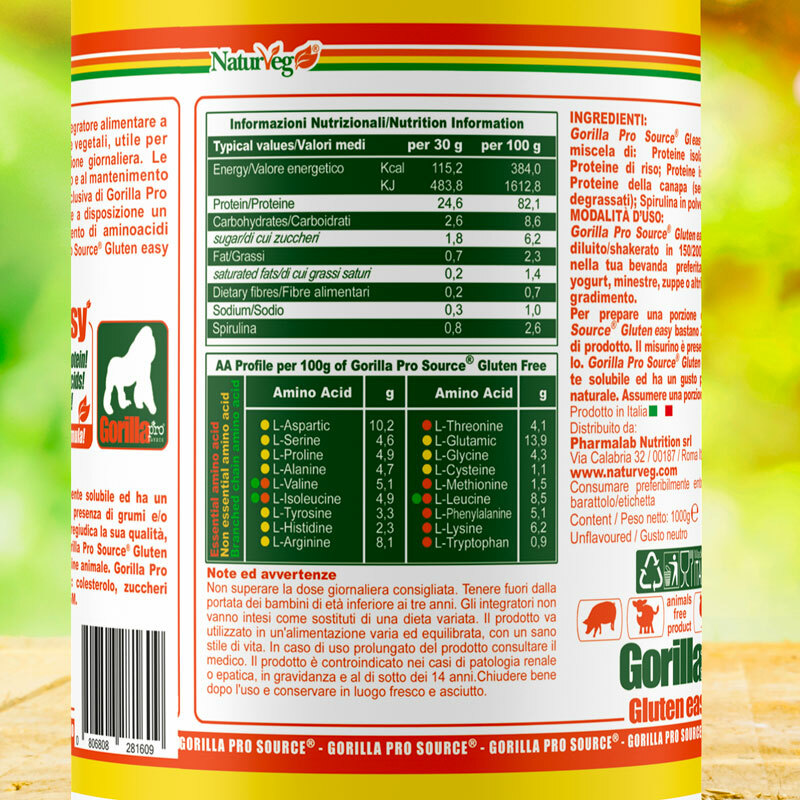 You will appreciate the fresh and natural taste of Gorilla Pro Source® Bio. 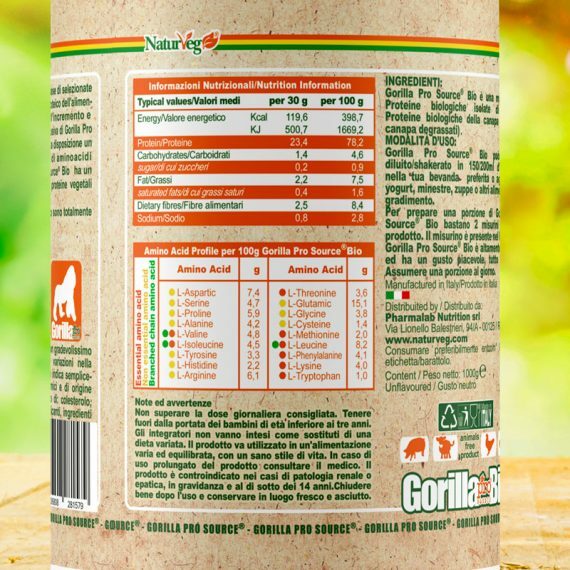 Mixing it with water, vegetable milk, fruit juice, soups or any other beverage you prefer, you will discover the authentic Bio. Naturveg®. 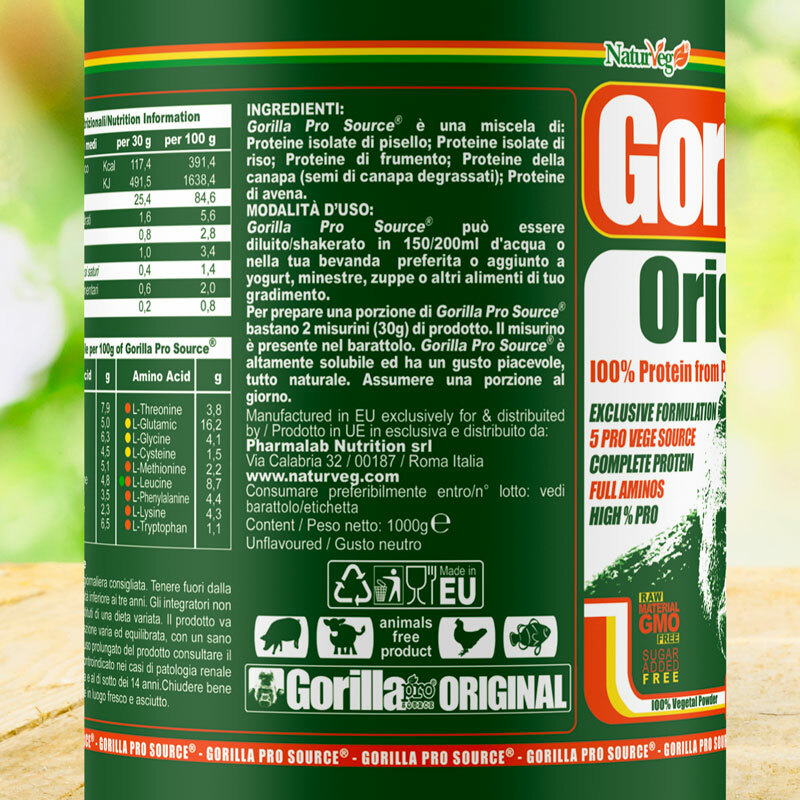 The proteins used in Gorilla Pro Source® Bio are organic protein isolates of peas and hemp. With its 5 plant proteins, Gorilla Pro Source® Original represents the top of the protein supplements dedicated to those who train intensively and target muscle building. In fact, Gorilla Original is also loved by those who seek only a complete protein supplement that doesn’t contain aromas and sweeteners (even if natural). 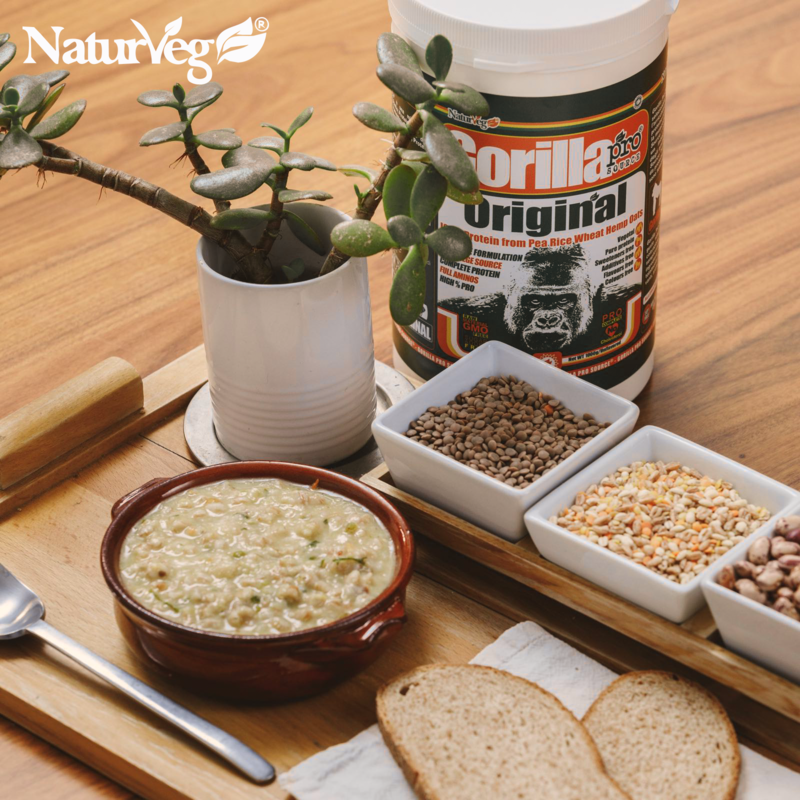 Original is loved for its natural taste, for its solubility, and for being an extremely digestible protein source, always at your fingertips. Gorilla Pro Source® Original is also appreciated by those who play sports or want to supplement their daily protein intake. 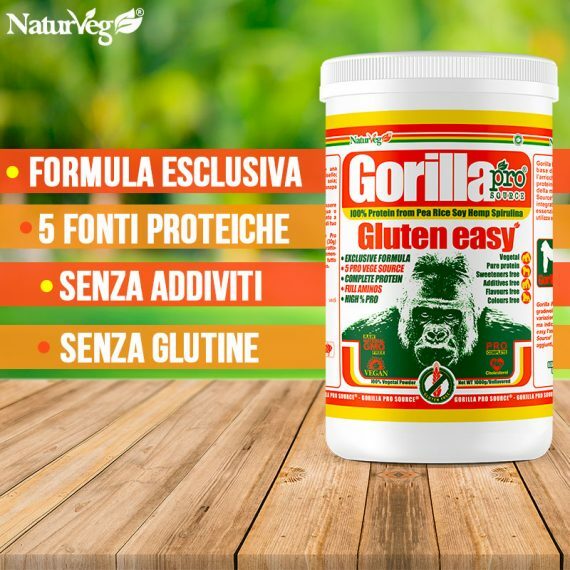 We have tested the Original with athletes of various disciplines, and those who take the training seriously and are committed. 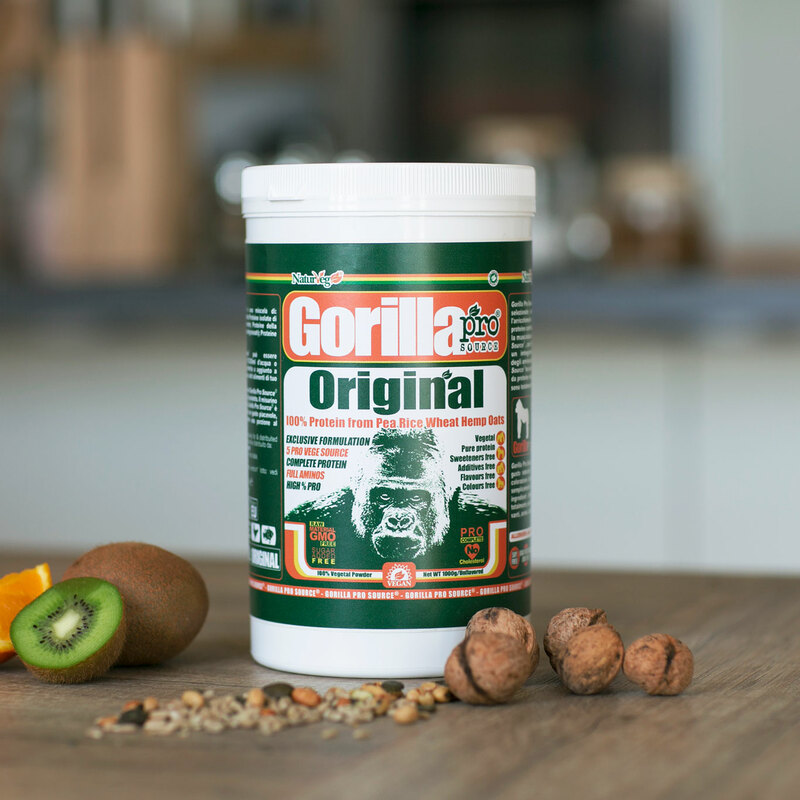 Gorilla Pro Source® Original is the athlete’s favorite protein supplement after the Gorilla Sport. However, we have also proposed our product to those looking for a protein breakfast or snack, and those who can’t eat healthily and satisfactorily because of work or family commitments. 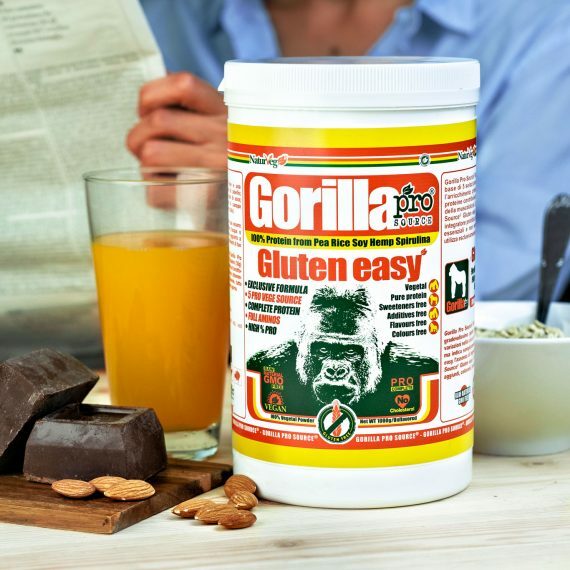 Everyone was thrilled by the Gorilla Pro Source® Original: because it only contains NO GMO proteins, it doesn’t contain any sweeteners, preservatives, emulsifiers, colorings, flavorings or any ingredient that is not a plant protein. 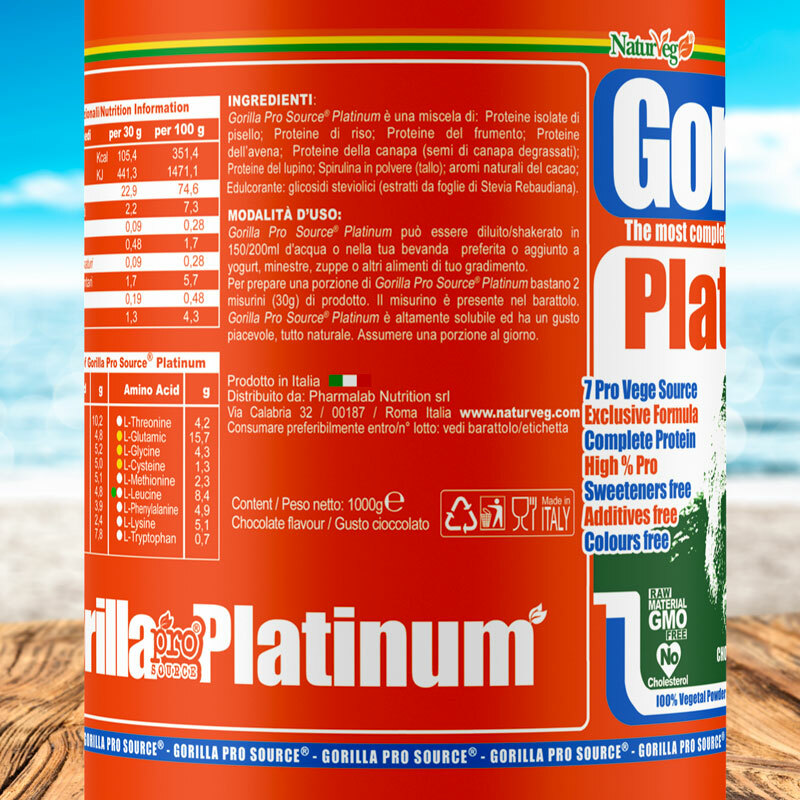 The precise formulation of Gorilla Pro Source® Original allows having a complete supplement available, with the presence of ALL the amino acids with excellent functionality and effectiveness for the nourishment and growth of muscle mass. 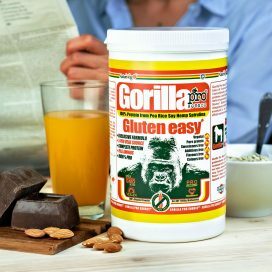 Five different plant protein sources have been specifically selected to create a complete product, with all the amino acids (essential and not) and a perfect balance between all the proteins, to obtain a synergistic formula, a perfect nutritional balance, high protein content, and perfect solubility. 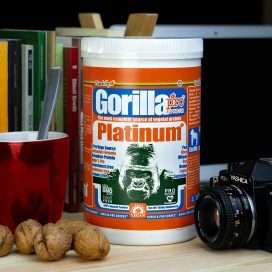 Each source is complementary to the others, enriching and optimizing everything. Gorilla Pro Source® Original is entirely vegetable and doesn’t use any protein derived from milk or eggs. 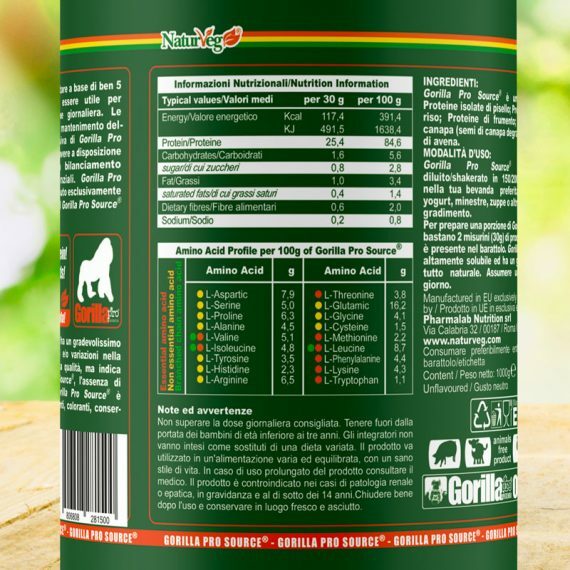 Nutrition experts know very well that milk and derivatives cause water retention and are not suitable for a dry and defined body. We didn’t want to add any additive to Gorilla Original. No milk derivatives, no preservatives, sweeteners, flavorings, colorings, GMOs or any other ingredient that doesn’t serve the purpose of optimizing muscles work. 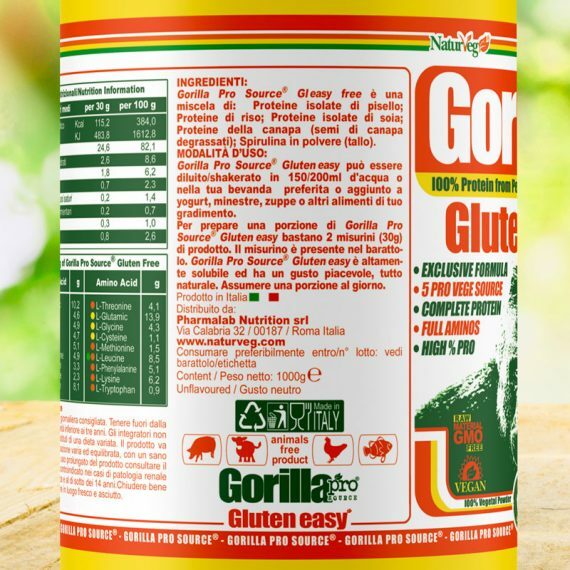 Unlike traditional protein supplements, the flavor of Gorilla Pro Source® Original is fresh and natural and doesn’t leave you with a lousy milk breath. Taste nature with Gorilla Pro Source® Original! 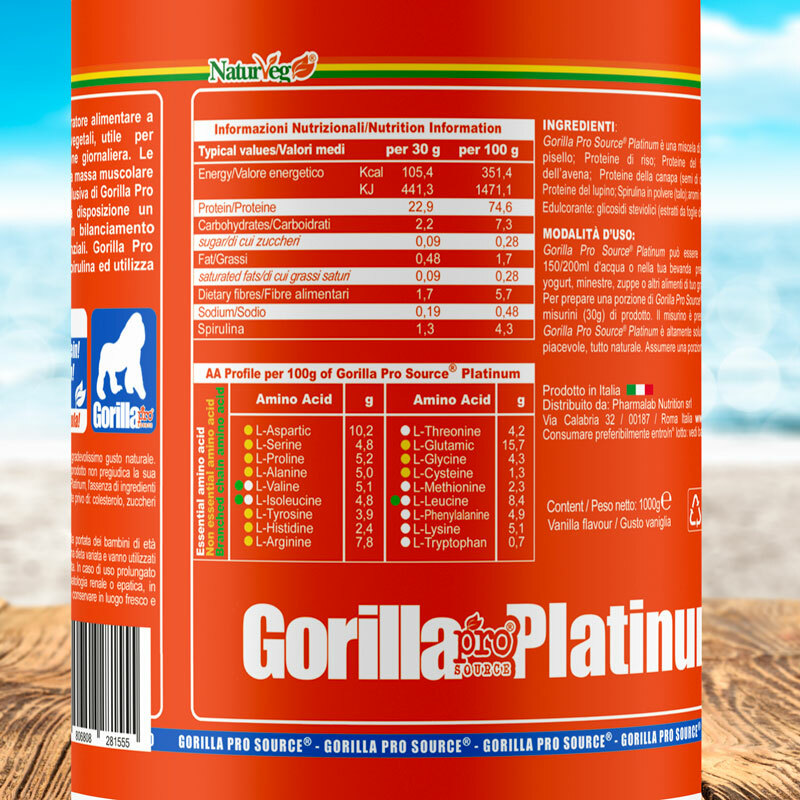 The extreme solubility makes it a practical, digestible and pleasant product.